This is a map of the AT&T microwave relay system as it was in 1960. It is interesting for several reasons. First of all, before there were communications satellites, this is the way that data was transferred from one location to another. That data would have been digitized and TDM encoded on a T-carrier, then loaded onto a microwave path. TV networks had loops that transversed the country, distributing network video and audio to all the markets in the US. The first transcontinental New York to San Francisco microwave route was established in 1951. 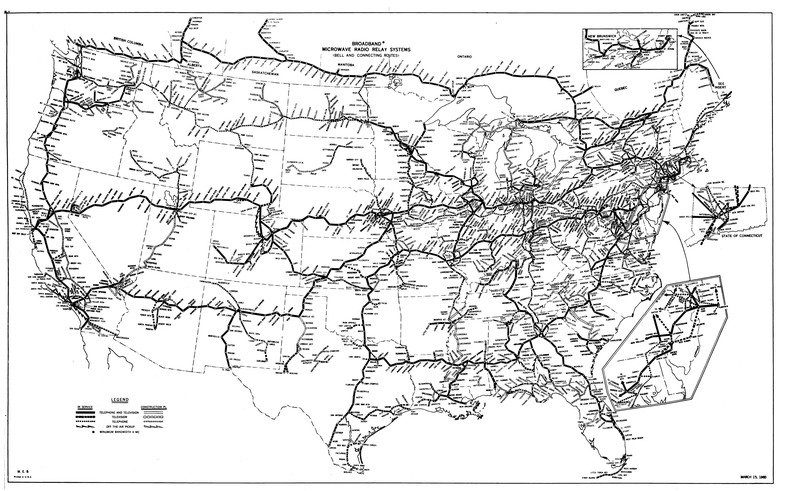 Through the fifties and sixties, the network was filled in across the US and Canada. Radio networks had been using wired TELCO networks for program distribution for years, although they required far less bandwidth than TV. This was during the time when network affiliation was vitally important to a station. Radio networks provided news and other special event programming, as well as some long form shows which were an important source of information for the listeners. Any network programming prior to 1980 or so would have been carried by this system. It was not until the use of C and Ku band satellite services that networks could offer multiple channels of programming. Now, entire radio formats could be programmed remotely and beamed into hundreds of stations across the country simultaneously. That would have been far to expensive to implement over TELCO lines, as the line charges were based on mileage of the circuit. This system included thousands of hardened microwave relay sites, each built to exacting specifications and fully redundant. At the time, the long distance telephone system was an integral part of the US defense planning. Sites were spaced 20-40 miles apart, depending on terrain. In congested areas, like the northeast, area mountain tops are dotted with these sites today, mostly empty. Most of these sites went off line in the late 1990’s as phone companies switched to fiber optic cables for telephone and data traffic. American Tower, Inc. purchased most of these sites in bulk from AT&T in the year 2000. Some sites are well positioned for Cellular Telephone, 3G and 4G wireless data services, plus other things like Media Flow and general use applications like FM broadcast and two way. Many sites, however, do not meet any specific need and sit empty. There was a large fire sale by American Tower in 2002 in which they unloaded about 1,900 of these sites as they were redundant. I wrote a post titled Cold War Relic: ATT long lines site, Kingston,NY detailing one of these sites near me. Keep in mind, there were thousands of these sites throughout the country.